The Meetings Industry Marketing Awards (MIMA) has been running for 14 years, recognising the hard work undertaken by marketers in the meetings and events industry worldwide. Now evolved into an inspiring networking event, MIMA showcases the best of the year’s marketing campaigns, as judged by key professionals in the industry. 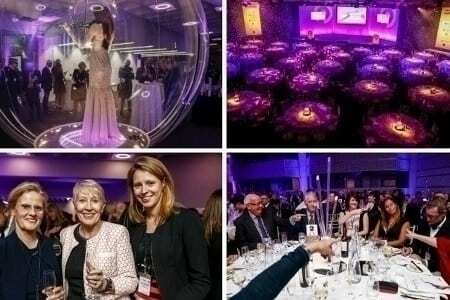 For the 2015 awards, organisers needed a venue that could welcome 400 of the leading figures in the meetings and events industry for a sparkling drinks reception and gala dinner. It was our task to host the awards ceremony and create an inspiring event with all the prestige expected of a glittering celebration. As a blank canvas in the heart of London, we can mastermind a diverse array of events, whether it’s parties, exhibitions, award ceremonies and fashion shows, or conferences and meetings. For the MIMAs, our flagship room the Churchill was the stand-out choice. We kitted out our showpiece location with glittering table centre pieces, indigo and pink lighting from newly-installed ceiling mounted moving lights and our new sparkling LED star cloth. The combined effect, created by our AV team QEII Live, created excitement, immersed guests in this special occasion and gave the ceremony the glitz and glamour this type of event deserves. Our recent investments have meant we’re now better equipped than ever for hosting awards ceremonies. Nine moving Robe Pointe lights, controlled by an Avolights Tiger Touch lighting board, combine with a new high definition projection system and a tab track installed for the star cloth to make it easier to use. We’ve also installed a centralised audio system, with touch panel controls, that enables us to choose and play music easily and transfer organisers’ music from their smartphone or tablet via Bluetooth. This helps set the mood for the awards. The superior lighting and equipment we’ve installed is better for delivering awards ceremonies that impress, but is also more environmentally friendly. Much of the audio-visual set up is built into the fabric of the venue, so there is less equipment on the floor to reduce seating capacity. The look is cleaner too. A show-stopping awards dinner deserves show-stopping food. Quality and elegant fine dining is at the heart of our food offer for awards ceremonies and banquets and our catering team QEII Taste can draw on a wealth of experience from the Leith’s family of chefs and venues. QEII Taste offers varying types of service dependent on the awards schedule and programme, from pre-laid starters and rolling service, to breaks between courses and fan service. It is absolutely bespoke every time and anything can be done. MIMA guests enjoyed melt-in-the-mouth thyme confit lamb rump, potato fondant, glazed carrots, pea puree and merlot jus. This was followed by an interactive dessert station, requested by MIMA, where we served Belgium chocolate and peppermint tea tarts, cinnamon and spiced apple pastries, orange and cherry crème brûlée and a British cheese station. The whole menu was designed to offer sumptuous dishes that would keep guests well fed, while complementing the theming and ambience of the ceremony and the evening. Hosting the MIMA was the perfect opportunity for us to show off the QEII Centre’s versatility as an events space and move away from the perception of purely being a conference centre, albeit an award-winning one with an international reputation for excellence. The MIMA organisers knew exactly what they wanted and we were able to go above and beyond expectations to deliver it. The integrated use of our new AV technology created an imaginative and immersive experience for both the hosts and the award winners, all while showcasing our facilities to great effect. The overall experience, from the new star cloth in the Churchill, to the mouth-watering menu with the very popular interactive dessert station, made the whole event a brilliant success. Awards ceremonies like this highlight the excellence of the wider events industry as well as what we can do here at the QEII Centre. It was a challenge to know we were being measured by our peers, but the feedback and thanks received from the organisers and guests was overwhelmingly positive – and if we can impress the best of the best in the meetings and events industry we’re onto a winner!